In some years wasps can present s significant problem. Bees evolved from wasps; nearly all wasps are ‘meat eaters’ whereas bees obtain the protein they need from pollen. Despite this evolutionary relationship wasps will readily raid beehives to obtain meat in the form of bee larvae or to steal honey and sugar. Their persistence can eventually wipe out a beehive and beekeepers need to be proactive in keeping the numbers of wasps down. Wasp traps containing jam and water are useful but of course they kill the wasps who are useful predators in the garden and countryside; it is unusual for bees to venture into wasp traps baited with jam and these can safely be placed close to hives. When wasps rob hives they ‘shimmer’ (fly from side to side) outside the hive door and then alight and attempt to walk into the hive, once they have done this a number of times they perhaps pick up the scent of the bees and seem to be able to come and go without opposition from the guard bees. Making the hive entrance as small as possible should assist the bees because they have a smaller space to guard. 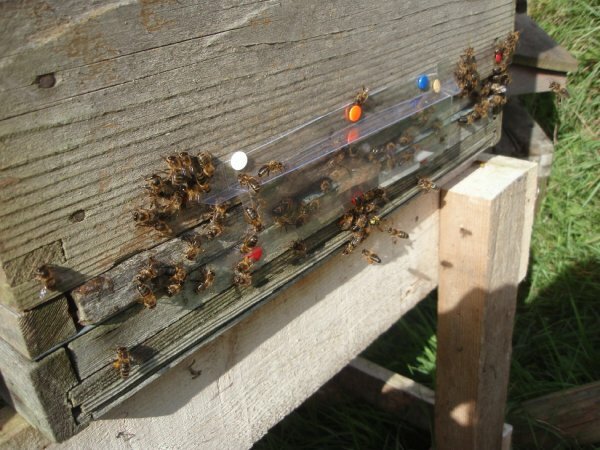 In desperation last year I made plastic doors that completely covered the hive entrances with a small tunnel left for the bees to come and go through at each end of the plastic cover. The wasps visual cue of the beehive entrance was therefore obscured by clear plastic (although, sadly there was no pile of concussed wasps on the ground) and the tide of honeybees departing through the ends of the plastic tunnel did seem to sweep thieving wasps back out. The honeybees quickly learnt to come and go through the tunnel.